» Prospecting Near Happy Camp. It was a beautiful June morning in Austin, Texas when my son Evan and I got up to leave for our trip to California. After killing some time getting some last minute things together and calling my Friend Truman to be sure he was ready to go, we finally set out. It was good to know that after months of careful planning and hard work, this trip started off only an hour behind schedule. No sudden problems cropped up–not a bad start at all. I have learned that if things start to slow you down and nothing falls in place easily, then it’s time to stop and take a good look to see what might be wrong. Usually I find the problem, or the potential problem, and stop it from getting out of hand. This works every time without fail for me, and sure makes things easier all around. After spending the night camped out with the rabbits at a KOA campground near Bakersfield, we grabbed a quick shower, a bite to eat, and rolled on up Interstate 5. We encountered very little traffic and no problems. Traveling was smooth all the way to Redding, where we got off the interstate to stop in at the Fish and Game Department to get my dredging permit. After a brief bit of being lost in town, we finally got the permit and were back northward-bound toward Happy Camp. (That name has a ring to it, doesn’t it?) I just love this little town–the laid back attitude, the friendly people, and no one rushing around in a hurry. It’s wonderful! It’s great! Just like a little fishing town I lived in on the Texas coast. Evan and I finally arrived in Happy Camp about 6:30 Monday evening. We had arrived just in time for one of the nightly activities that is put on by the New 49’ers Prospecting Club during the summer months. These things are always a lot of fun and a person can meet some very good people in addition to picking up some good information. Now, getting up on Tuesday morning wasn’t a problem at all, as we were both keyed up and ready to go. Evan and I started off by getting needed parts and other things at the Pro-Mack shop. The people who work and run this store are the most helpful folks you have ever seen. They will patiently listen to your questions and answer them if they can. If not, they will direct you to someone who can. While I was there, I left a note for our friends, Truman and Ruth, so they could find us without any trouble. On we went out Highway 96 to a claim that I wanted to try. Two years before, two other friends and I tested parts of this claim and were not too impressed; but I always felt that we didn’t sample the right area. In looking over this claim, I had spotted an area just past a set of mean-looking rapids that had a large chunk of stone missing from a sheer rock wall which formed an eddy pool about 15 feet by 20 feet. This was right on the inside bend of the river–right when the water started to slow down after the rapids. It looked real good. Sure enough, the water level in the river was low, and it looked like we should be able to work the spot. “Oh Boy,” time to set up the dredge. We drove down to the river about a quarter of a mile above the rapids where there was better access, and put together my five-inch dredge. This went very smoothly which surprised me; because I had extensively-overhauled this Keene five-inch dredge so that it didn’t look like its normal self at all. The next step was floating it down to the rapids. After looking things over, I decided not to float it through, but to winch it around and over the rocks. About half way across the rocks, we stumbled onto a come-along-winch that someone had lost, possibly the previous year. It had some rust on it; but after a minor application of oil, it worked very well. Moving the dredge took almost two hours to get over about 200 feet of rocks (next time I will float it through and not be so chicken). After resting for a few minutes, we went back to get a load of things we floated to just-above the rapids on an innertube. On the way, I found a seven-pound lead dive weight and thought I sure was getting lucky finding things. Then, getting back to the dredge, I discovered that it was one of my own weights that had fallen off while we were moving the dredge. Oh well! Evan and I finally got the dredge to a gravel bar on the opposite bank from where I was going to work, and parked it there. I ran a line across the river, got it firmly attached to a boulder on one side and a big tree on the other, then tested it by coming back across hand over hand. Well, OK, I didn’t get all the way back across, but it was fun trying. My son didn’t know what to think of his father acting so silly hanging from a rope going across the water. I discovered that all this time, while I was stringing the rope and tying it off to the tree, I had been as close as three feet to a wild bee hive. Well, they didn’t bother me, so I didn’t bother them, and that’s the way it stood between us for the rest of our stay in the area. By the way, the hive was about the size of a basketball. The next part was the most difficult so far because I had to put everything on the dredge and pull it across the rapids without turning over or losing it. So I sat down and studied the current and the flows and calculated how much rope to use, where to tie it and what angle to tie it on the dredge. It helps to understand about this kind of stuff in order to let the river help as much as it can and not fight you. Well, we launched the dredge. It floated out a little way and then got caught in a reverse current. It floated upstream quite a bit, then shifted into the main current and started across a little faster than planned. About halfway to this side it reached the end of the rope and tried to play like a submarine. Finally the poor thing came up and smoothly settled into the notch in the cliff where I wanted it. Lucky! Meanwhile, Evan was waving to get my attention and pointing down stream. When I looked, I saw the last few inches of the suction hose dive under water. Good thing the river was making plenty of noise, because what I said about that hose didn’t need to be heard. Oh well, the only thing to do was get my mask on and dive in. It took about ten minutes to locate the hose, then another five or ten to get it back on the bank. The water was about 12 to 15 feet deep where it stopped, and it took four dives in the swift current to even put my hands on it. The rest of the afternoon was spent getting the dredge ready to go. When it was all done, Evan and I went back to camp, rested for a while and ate supper. We then returned to Happy Camp for the night’s activities with the New 49’ers. Now I’ll tell you the whole trip is worth making just to attend the activities that are put on by The New 49’ers. I met some of the best people I have seen anywhere at these get-togethers. This night, I met a family from Georgia, and I really liked them from the moment we met. It turned out we were camping in the same campground and they were just around the bend down-stream from my son and me. They also had children the same age as my son, so that worked out great. Wednesday morning dawned; and, by nine, we headed for the dredge and got it fired up and operating by 10. The water temperature was just right for dredging, very comfortable. Visibility was around 15 feet, and I considered that good. This area had looked great when I scouted it out. Being on the bottom with a suction hose made it look even better. Working the gravel, I could tell it had not been dredged. When I uncovered an old car frame, mostly rusted away, I knew it hadn’t been touched at least as far back as the 1964 flood. This looked good! An hour and a half later, when the first tank of gas ran out, I checked the sluice box and saw good color at the head of the riffles. I have a small one-foot square area at the top of the riffles that I can remove the sample carpet from, and so I panned this out. Wow! 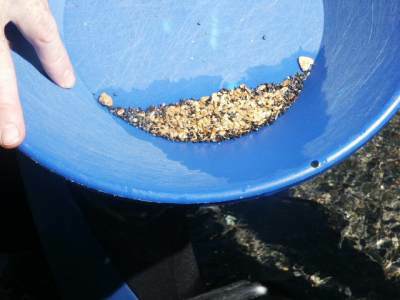 What came out of that section was the most gold I have ever seen come out of any of my dredging experiences! I have seen some pictures of gold in a pan like this, but it was a thrill to do it myself. I finished panning this down and set it aside to weigh it separately. (It came out to two penny-weight.) The next tank-full of gas that I ran through the dredge produced about the same results. 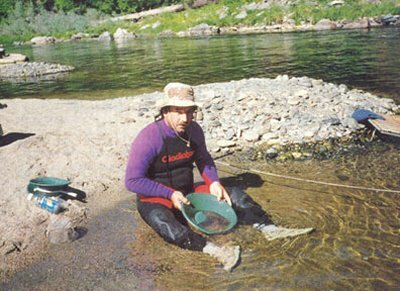 As I cut deeper into the streambed, the amount of gold kept increasing for the next four days. While I was on the bottom dredging, Evan was busy on the bank classifying some gravel he was digging at a spot I found for him. After he got about half a bucket full, he sat and panned it out. He did very well at this and always had some colors in the pan–sometimes he had a lot of them. Anyway, he stayed dedicated to panning for a longer period of time than I had thought he would. Also, when I would gas-up the motor, I cleaned the top of the sluice. Then I would separate out some of the concentrates to give to Evan to pan out. He really enjoyed this, because there was so much gold coming from the dredge. It wasn’t all fun and games. I had to move some big rocks out of the way and that was no problem, but the one I waited too long to move was the one that almost got me. Yep, “The Loomer,” that one I just didn’t want to move yet–the one I would get to in a minute–the one that wasn’t really dangerous. Yeah; that one! Sure enough, I took my attention off it and turned to do something else. Well, when it started to move, I actually sensed it and instinctively jumped and pulled my legs up at the same time. It’s a good thing I did, because when the rock rolled, it missed my legs, but nicked me in the arm hard enough to throw me a few feet out of the way. It didn’t hurt, but it stunned my arm for a minute or two. After the silt cleared and I could see the real size of the rock, I set to work moving it out of the way. This rock was about 600 pounds, so it took a while to move by myself. All the while I was moving this thing I was wondering what I was doing this for anyway. But the longer I worked, the less I worried about it. You know that saying about getting back on the horse that threw you? That really does work! I felt better about the whole situation after I worked around that rock and finally moved it out of the way. On Thursday, when we stopped for the day, we discovered that Truman and Ruth had finally arrived in camp and wanted to know how we were doing. We had split up at Bakersfield so they could go to visit some places around San Francisco; then they went up the coast to Eureka and finally across to Happy Camp. It was nice to have them in camp, so the next morning I took them down to the river to show where we were working. I showed Truman where Evan was digging and panning, so the two of them did that while I went back dredging. (I also showed them where the bees were.) These two people are the best people I know, and I think a lot of them. Truman and Ruth stayed with us for a few more days, and then they had to head back home. But in that time, we sure had a lot of fun and they both learned how to walk on river rocks without slipping too much. Saturday was a big day back at Happy Camp. The New 49’ers were sponsoring a coin and prize hunt and the big Saturday barbecue. This is an event you don’t want to miss. More people were there than you could find the time to talk to. It was a grand event–lots of prizes and coins, not to mention the real nice folks. The potluck and barbecue-lunch was marvelous and that barely describes it. Enough of the fun and games, and it was back to dredging the next day for us. I continued to work that area, and when the hole reached a layer of packed and rotten branches mixed with tree stumps and logs, I spread it out further until I ran out of room to work. After this, I cleaned up the sluice completely, then got back in the water and began to break up the mass of wood to get underneath it. This was the first time I had run into anything of this nature. The stuff would mostly turn to a reddish powder when I touched it and cloud-out the area. The layer under it turned out to be loose-packed and made of fine crushed stone but had almost no gold. I was expecting to find some big nuggets or a lot of small ones, but it really turned out to be a disappointment; because after getting through it, I found nothing on the bedrock. So, I quit and checked the sluice–sure enough, after panning out the sample carpet I only found 12 to 15 colors, so I pulled the dredge back to the other side to sample there. After sampling several places, I didn’t find any amount of gold to make me stay and work. Sad to say, but if I had tried a sample hole another 100 feet from where I stopped, I would have found another good pocket that produced as much as the one I worked. (It turned out that I was able to return to this area a month later, but that is another story.) I usually keep good records of the time I spend every day actually dredging, so I checked to see what the statistics were on this spot. It turned out that I was only dredging this hole for close to 12 1/2 hours total work-time under water. This produced close to 35 pennyweight of gold. Figure that out and it comes to over 2 1/2 pennyweight an hour. That’s not bad for a five-inch dredge and an semi-beginner who has only two years part-time gold dredging experience. 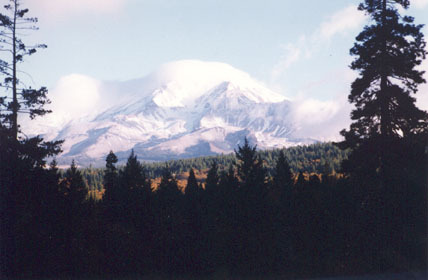 On Saturday of the next week, my wife Mary flew into Medford, Oregon, where Evan and I picked her up and brought her back to Happy Camp. We had been gone so long, she sure was glad to see that her long-lost husband and son were safe. She also loves Happy Camp and looks forward to going back next year. All three of us spent the next week going around the area sampling here and there, just having a real good time. I showed Mary how to pan gold and that kept her busy for quite a while. She gets excited when she finds some color in the pan and calls me over to look at it. 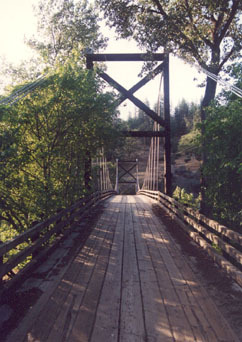 If there is a more beautiful part of this country than this area of northern California, I don’t know where it would be. The beauty of the countryside as we drive through is a wonder to behold. We really enjoy our trips out there and discover something new every time we visit. After all this, you might think I would wait until the next summer to come back. But as we were leaving, I was thinking that it sure would be nice if I could return to California sooner than that… Well, it turned out that things arranged themselves in such a way that I came back at the end of August–but that is another story. 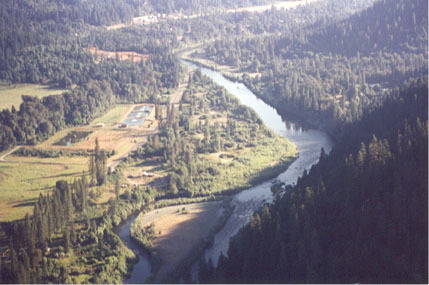 See you on the Klamath!